In my last review, which was of the Christmas musical Elf, I prefaced my opinions with an apologetic disclaimer explaining that musicals weren’t exactly my forte, or indeed my cup of tea necessarily, so that the dear reader may disregard all that followed if they required an informed review as paramount. At the risk of coming across a completely uncultured swine to whomever may have had the displeasure of now reading both this and the last review (namely my mother, I should imagine), I’m afraid I must include a similar opening. My experience of ballet is limited, in that I have no experience of ballet. I was never taken to the ballet by any arty family members growing up, I have never had a partner who was a ballet enthusiast to bring me along, and despite my silky movements and frankly unnatural flexibility (not true), I have never performed myself. Still time though. 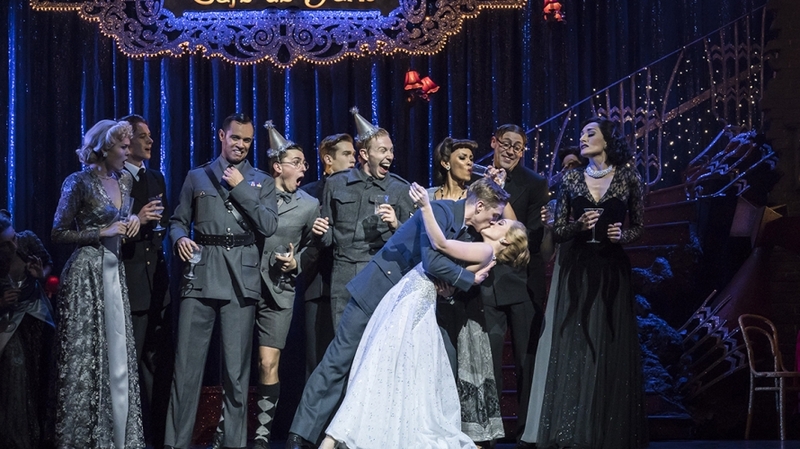 Anyway what I’m getting at is that I have no reference point as such to compare Matthew Bourne’s Cinderella with, but nonetheless I will offer my thoughts, such as they are. So the classic fairytale of Cinderella; poor young girl is mistreated by her evil stepmother and stepsisters, they wont let her go to the royal ball, with the help of her fairy godmother she goes anyway, falls in love with Prince, leaves at midnight, Prince tracks her down using the glass slipper she accidentally left (because apparently he has amnesia and she is the only size 4 in the kingdom? ), they live happily ever after. You know the drill… or do you? Quite fantastically, the tale is retold in this production in a wartime setting. The mythical kingdom becomes London in 1940, during the Blitz. The Royal ball becomes a jazz night at the Cafe De Paris, a real club that was frequented by glamorous people during the war until it was obliterated by two bombs one night killing 34 people. In all honesty, I wasn’t completely sold on this change of setting initially, specifically during the first act; it just felt a little forced and contrived. But I felt that this setting really came into its own in the second act, with the introduction of Cafe De Paris, the streets of London and Paddington Station. The sets were stunning (credit to set designer Lez Brotherston), with wonderful detail and the transitions between sets and scenes required feats of engineering that it struck me NASA would be proud of. In terms of the story, I was a little concerned beforehand how the story would be told, familiar though we all are with it, through this medium. What I hadn’t anticipated was the physical acting capabilities of the performers involved, who all wonderfully portrayed their characters through small movement, posture, and expressions. I suppose everyone’s familiarity with the general story helped, but the story did diverge heavily from the original source material and it is a credit to the performers and the direction of Mr Bourne himself that the story was told so clearly and effectively. The ballet itself… as in the actual dancing (god I’m so out of my depth) was hypnotising and enthralling, performed with unmistakable talent. The show, fantastic as all the cast were, was stolen for me by the leads, Cinderella herself, played by Cordelia Braithwaite, and The Prince, or this case The Pilot, Harry (Prince Harry? A little pun there maybe?) played by Will Bozier. The two had electric chemistry, and my highlights of the show were their dances together, in particular Cinderella’s imagined danced with Harry, who plays a mannequin – it’s hard to explain. Will Bozier’s dancing as a mannequin, not quite moving in the way Cinderella wishes, staying straight and tense while at the same performing this extraordinary sequence was both funny and mesmerising. My word count tells me that I am approaching my limit, and I feel that I haven’t even made a dent on describing how much I enjoyed this production. But to summarise, I enjoyed this production. The beautiful score, the incredible performances, the stunning costumes and set design, it really was a evening I wont forget in hurry; I will definitely look out for the next Matthew Bourne show. Take it from me – you don’t have to be Billy Elliot to enjoy it, or even know who he is.